It seems like stand-up patient lifts just keep getting better – easier to use, more stable and secure, and more maneuverable. The Invacare Reliant RPS350 stand aids shown here are all that, plus they're fully adjustable and will provide comfortable transfers and support for patients of any size and shape all the way up to 350 pounds. There's a reason racecars are built so low to the ground; the Invacare RPS350-1 and RPS350-2 have low centers of gravity for maximum stability and can roll under most beds, with a need for just 4.5 inches of clearance. The primary difference between the two units is that the -1 has a manual leg spreader, and the -2's spreader is motorized, utilizing rechargeable batteries included with the lift. The spreader is what moves the base legs apart for easy patient access. This is especially desirable when moving your patient to or from a chair, wheelchair or toilet seat. Both units have a motorized patient lifting feature. The motorized spreader on the RPS350-2 has its own separate motor that's powered by the same batteries that operate the lifter. Batteries are easily removable for convenient charging via the included charger. The units function as a means of standing support, in which the easy-to-attach standing sling is used, or for patient transfer, where a transfer sling is used. Your new lift will come equipped with a standing sling at no additional cost. You'll have the option of selecting a standard or XL-sized sling. Additional slings can be purchased separately. They're easy to affix and feature numerous adjustments for maximum patient comfort. The only caveat with using this Invacare patient lift is that patients must be able to bear a portion of their own body weight. If incapable of bearing a load, they will simply dangle, with no control. 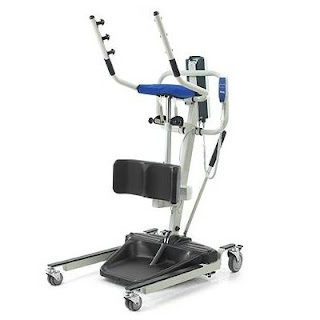 These units are also excellent for rehab patients requiring standing support. The Invacare RPS350 stand-up lifts are, hands down, an invaluable health aid for both homes and care facilities. They're ideal for use in day-to-day patient handling.